Coffinhop.Blogspot.com is putting on a literary event between October 24th and 31st that is literally going to blow the walls out of the independent horror community’s asylum of the damned. If you haven’t been following the details on Twitter from the #CoffinHop hashtag, let me get you up to speed. The Coffin Hop is the brainchild of authors Axel Howerton and Julie Jansen, with the purpose of giving authors the chance to cross-promote with each other, as well as the opportunity to meet and learn from others in the genre. Of course, all of the participants are looking to increase their blog traffic from both current and potential readers as well, and many participants have come up with contests open to anyone who happens to peruse their blog. So far, I’ve seen limerick, poetry and art contests from the various Hoppers’ blogs that I’ve managed to visit. And there are many. Some of the talent who’ve joined up are Dead Spell scribe Belinda Frisch, Nightface wordsmith Lydia Peever and even the good folks at Dark Moon Digest have joined in on the fun. Also joining the Coffin Hop, a powerhouse of horror whose newest release dropped just days ago, The Pumpkin Man himself, John Everson. What you’ve got here are some of the best and soon-to-be best in horror literature all lined up. So go ahead and see if this coffin fits. Author participation is closed, as the Hop has officially started, but anyone interested in horror, authors, contests and prizes can click the above link to be taken to the official home and the list of participants. It’s a great chance to discover talent that you’ve not yet had the pleasure of reading, and you could walk away with a ton of swag! 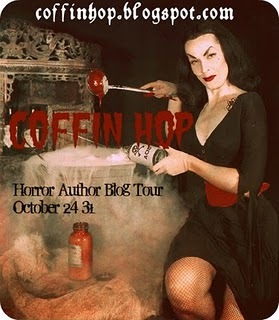 If you’re on Twitter, simply search #CoffinHop to see who’s posting about it, and start at that person’s blog. Everyone has a link back to the main page, so the whole deal is foolproof. Remember that authors both need and love feedback, so if you’re asked for comments, please leave them. You could win stuff! This entry was posted in Giveaway, News by We ain't here anymore. Bookmark the permalink.